I’ve had a lot of different Chex mixes in my day. The ever popular Muddy Buddies are dangerously addictive (and bad for you) with their chocolate, peanut butter and powdered sugar goodness. I’ve also enjoyed a few of the savory mixes with soy sauce or other “exotic” ingredients (not including pretzels which I’m not a fan of). But this recipe from the Chex website was the closest to something I would actually want to make and eat as a guilt free snack. I adapted it slightly to add some flavor, and to make it edible for all my gluten sensitive friends out there. I have to admit that there was a time in my life that Chex mix made me shudder. I’m not really a germaphobe, I’ve eaten food off he ground, even licked the pavement as the result of a dare. But Chex mix reminded of the bowl of mixed nuts on a bar; you don’t know whose hands have been in it or where their hands have been. Or even worse you do know because you just saw the person scooping up handfuls of nuts not wash those same hands after using the restroom. But then I realized that at my own party I can easily remedy this issue, simply by providing a serving spoon. Duh…I mean… Hooray! Chex mix is back baby! My husband can’t quite understand my feelings on this because I’m a huge fan of bulk bins, which he sees as having the same problem. But somehow (thankfully) it’s different in my mind. This Chex mix recipe was passed on to me by a nutritionist I work with. We made it in the holiday special of the Healthy Cooking on a Tight Budget program, and I’ve since had several participants tell me they made their own to give as gifts over Christmas. While it does have some brown sugar and butter, a lot of the sweetness comes from orange juice concentrate, which also gives it a great citrus flavor. I couldn’t leave the recipe exactly as is so at home began playing with some different spices to give the flavor a little more oomph. I chose to use corn and rice Chex to make a gluten free mix. You can use whatever varieties you like, I just choose do gluten free whenever it’s that easy to do if I’m not sure of the food sensitivities of my guests. This is a crazy cheap party option whether you’re hosting or bringing a dish to a potluck. It only cost me 18 cents a serving! 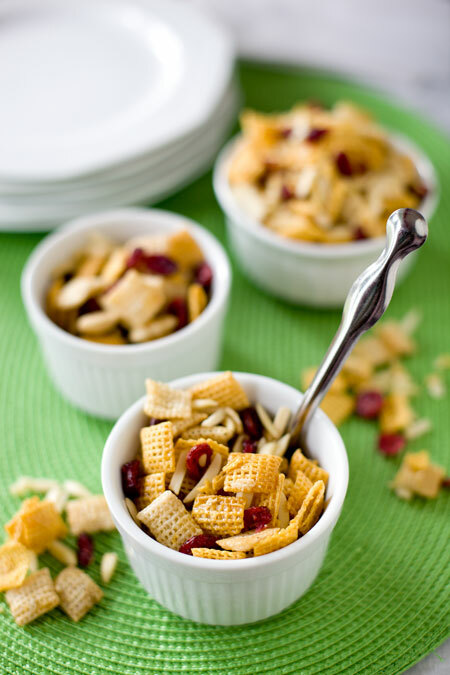 Do you have a favorite snack mix? Place the butter, brown sugar, orange juice, cinnamon, all spice and nutmeg into a large microwaveable bowl. Melt it all together in the microwave about 2 minutes (until melted and easily mixed). Mix the cereal and almonds into the now melted mixture. Use a large spoon to stir the cereal and almonds until they are evenly coated. Microwave the mix on high for five minutes, stirring halfway through. Add dried cranberries and stir again to mix them in. Spread on wax paper to cool, then store in an airtight container. Serve in a large bowl (with a spoon! ), or divide into 1/2 cup servings and pour into small bags for gifts. Approximate cost/serving: I got Chex when they were on sale, 3 boxes for $5. It took less than two boxes to get 9 cups. The total cost was about $3.80 and at 1/2 cup per serving that’s just 18 cents a serving!!! Vegetarian/Gluten Free: Yes to both though it’s not vegan due to the butter. This recipe also receives the Eric sweet tooth seal of approval! 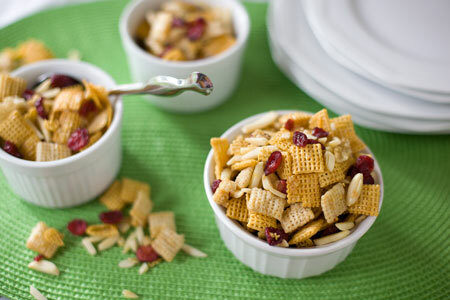 I love chex mix…not to mention the cranberry orange combination! great idea!! Yummy!! Can’t wait to try it out on the kids! wow…really liked this instant mix. Ideal to make when expecting big gatherings..! I haven’t seen this combo before…it looks really good! I made this today and its very good. A lot of flavor. I will take this to work for a snack rather than my usual kit kats. Hi Mary, so sorry I’m just now replying. We got way behind on comments with our new baby! Glad to hear you liked the Chex Mix. Definitely a healthier snack option. Thanks for stopping by and commenting.